It has been said that Los Angeles and San Francisco were the last major metropolitan cities in which punk music scenes developed and once it hit California, punk changed shapes numerous times, spread to every corner of the United States and became a permanent fixture in popular culture. In 1984, a teenage Dave Travis decided to capture punk rock in Los Angeles on video tape, a fascination and hobby that he would continue until 1997, logging in hundreds of hours of Los Angeles area shows and interviews. 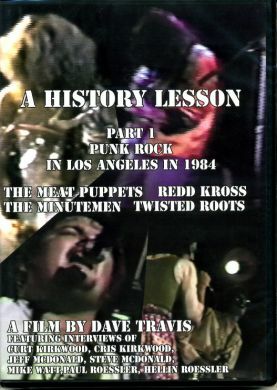 In “A History Lesson Part 1," Travis presents live footage filmed in the spring of 1984 featuring the Meat Puppets, Minutemen, Twisted Rootsand Redd Kross interspersed with interviews of members from each group which examines and puts a perspective on the early years of “psychedelic” punk rock in Los Angeles and Phoenix, AZ. Each song by each group is presented from start to finish.